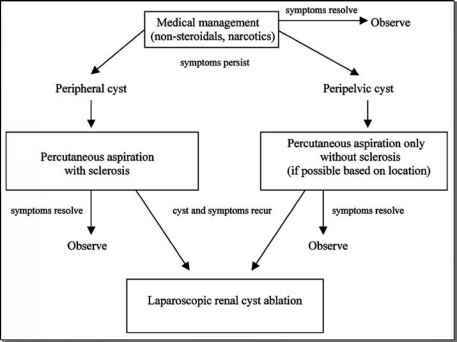 Infectious conditions of the kidney provide significant challenges to laparoscopy. The inflammation causes the development of dense perinephric fibrosis around the kidney, with the possible involvement of the perihilar region. In such situations, a transperitoneal approach has been advocated over the retroperitoneal approach. Open conversion should be strongly considered if the perirenal fibrosis is dense and the dissection during laparoscopic nephrectomy is particularly challenging and not progressing. Laparoscopic nephrectomy for xanthogranulomatous pyelonephritis is feasible. The scant available data suggest longer operative times and no clear advantage over open nephrectomy. Laparoscopic simple nephrectomy in xanthogranulomatous pyelonephritis cases should only be attempted by the very experienced laparoscopist. Laparoscopic nephrectomy for tuberculosis is safe and, with sufficient laparoscopic experience, appears to provide the same benefits as for other benign noninflammatory conditions. The transperitoneal approach provides better exposure and larger working space for this potentially difficult dissection. One study evaluated laparoscopic nephrectomy in 12 patients with inflammatory renal conditions, including chronic inflammation/fibro-sis (eight), xanthogranulomatous pyelonephritis (three), and tuberculosis (one) (14). Outcomes were compared to those of nine patients undergoing laparoscopic nephrectomy for noninflammatory conditions. Operative time was longer (284 minutes vs. 226 minutes) and conversion rate was higher (16% vs. 0%).